We are constantly experimenting and testing our ideas before we invest a lot of time and money into something new. If we can’t find resources that are specific to our north Idaho micro-climate, we test other regional theories to see how or if they will work here. We have definitely found that what works in other parts of the country often doesn’t work here. The micro-climate at our farm has many variables that we always consider when determining the success or failure of a new crop. Our elevation, slope, aspect, and ever changing climate have taught us to adapt and use a multitude of season extension techniques. On-farm research has been a useful tool for problem solving and answering specific questions about our production system. Thom and Diane both have backgrounds collecting field data for the USFS, and were taught early on the importance of recording accurate field information. Our fields are mapped with rows numbered and easy to identify location of plots, specific crops, and field applications. Because we are a certified organic farm, we are required to maintain clear records of everything that we do in the fields and have been told our methodology is exceptional. We maintain a daily journal of everything accomplished in the fields and gardens to correlate with our field maps, as well as planting and harvest records and have field records dating back to the first year we certified organic (1992). We have both used data recorders and have proven competent and consistent collecting and maintaining field data using technical tools, taking measurements and documenting our daily observations. We are always experimenting with different methods to compare crops, seed varieties, companion planting and cover cropping techniques in the fields and have found this to be a powerful decision-making tool. We are open to trialing new practical organic methodology, different management styles, and new methods that might benefit future organic farmers in the region. Universities around the country are responding with new undergraduate, graduate, and research programs in organic farming and sustainable agriculture and we want to be a part of this movement. 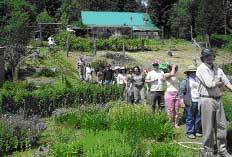 We have successfully collaborated on an assortment of field days and projects with students and University Extension from Washington State University, University of Idaho, Montana State University, the Organic Seed Alliance and the non-profit sustainable agriculture organization Rural Roots. Students and faculty have joined us for educational field days on the farm from a variety of campus departments, including Horticulture, Environmental Studies, Plant, Soil and Entomological Sciences, and the College of Agricultural, Human, and Natural Resource Sciences Department of Entomology. We have cooperated with undergraduate and graduate research programs as well as postdoctoral scientists. When we first decided to explore different options of on-farm research, we were happy to find that there were a number of publications available to help us succeed. Having these resources available to us helped us meet our commitment with universities and the private sector as well. The Sustainable Agriculture Research & Education (SARE) program has some amazing information that has come from other farmers doing on-farm research. We have been involved with an assortment of SARE projects over the years we’ve been farming are find that there is always something new to learn, and are happy to share what we learn with others. Their programs fit well with undergrad and graduate grant opportunities for research. Courtney Cosdon is a masters student at the University of Idaho, studying Environmental Science within the Soil and Water Systems Department. She approached us requesting that Greentree Naturals partner in this experiment and research opportunity that was funded through the Organic Farming Research Foundation. I asked Courtney to write a paragraph or two about her research project. Soil testing is a reliable method to obtain a snapshot of available nutrients in the soil, allowing growers to obtain a better understanding of which nutrients they may need to replenish. While soil testing and fertility management are standard Extension topics at most Land Grant institutions, programming is not always focused on small-acreage organic systems and growers. 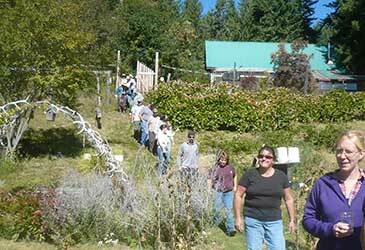 This has resulted in underutilization of soil testing in organic certified systems in northern Idaho. It is important to increase knowledge to improve sustainability of these systems, especially considering recent trends for increasing organic acreage within the state. This project aims to 1) understand how relatively new soil health tests (Haney and permangante oxidizable carbon, POxC) correspond to more commonly utilized fertility tests, 2) how soil test results correlate to yield and crop quality in organic systems and 3) determine the suitability of using extractable nitrogen from the Haney test to determine fertilizer needs. We are working with Diane, as well as two other organic farms in Northern Idaho to test three different fertilizer application rates. The first two treatments are based on the new and the standard soil health tests and the third is a replication of what the grower might apply in the absence of soil testing. We are growing beets and carrots and then comparing the yield and quality among treatments after harvest. Overall, we expect to provide new information that allows organic growers to better manage soil health and fertility while demonstrating the benefits of conducting soil tests. Courtney's test plots laid out in beets and carrots row. An increase in organic farming throughout the United States has ignited interest about the practices that these farmers employ, and the pest control services they provide. For the past two summers I have had the joy of working with many farmers and researcher collaborators on the Biodiversity and Natural Pest Suppression (BaNPestS) project, which seeks to identify traits of soil, plant, and arthropod communities typical of successful organic farms. The project itself grew out of the organic movement, as there were many anecdotal and small-scale experimental examples of traits and patterns of successful organic farms but little done at the broad scale to confirm them. A common anecdotal observation was that key pests of brassicas become less impactful over time in organically managed systems, specifically Imported Cabbage Worm (Pieris rapae) and Diamondback Moth (Plutella xylostella). This is in contrast with other pests that are still proving problematic like the Cabbage Aphid (Brevicoryne brassicae). 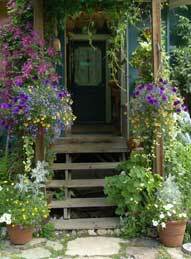 We sampled farms throughout the Pacific Northwest, but I always looked forward to coming to Sandpoint. It is enjoyable to talk to new farmers, but there is something special about learning from someone with Diane’s extensive experience. I remember one instance in particular; we were setting up our traps and chatting with Diane and she brought up the elusive nocturnal pests, cutworms. She spoke of going out at night to mechanically remove them, a story that stuck with me as I continued my travels. 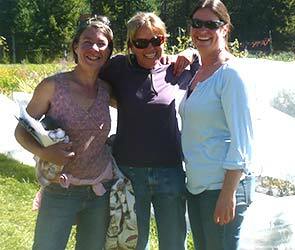 It just so happened that a month later we met a farmer in Washington with a novel problem. Each morning they would wake up to damage on their plants, but couldn’t identify the culprit. Well, when we were chatting with this farmer about the mystery pest the anecdote about hunting cutworms at night came to mind. We asked them to try ”hunting” at night, and sure enough I later heard from them that cutworms were indeed their real problem. It made me glad to be able to help a farmer solve an enigmatic problem, made possible thanks to the shared information of experienced organic farmers. Given what we have already learned just from conversations with farmers, I am excited to see what tools we discover as we analyze our data. Stay tuned! Cooperators: Dr. Stephen Love, Jen Jensen, Tony McCammon, Wayne Jones, Lance Elis, Ariel Agenbroad, Stuart Parkinson, Dr. Tom Hess. This project expands on previously conducted high tunnel research with the primary purpose being to focus on increasing local food production. Unique features of this research include an objective to augment knowledge on superior design specifications for high tunnels built and used in harsh climates, and to provide recommendations for crops and varieties that can be grown under high tunnels to increase food production of grower profitability under these same harsh climate conditions. 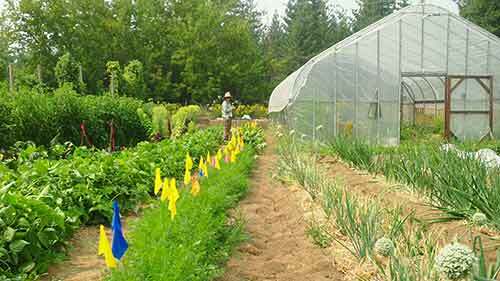 This project engaged eight University of Idaho faculty members and five Idaho producers in geographically and climatically diverse regions in research and field trials using high tunnels for season extension of horticultural crops. 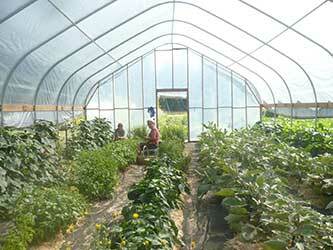 The project team of faculty and producers has designed, built and tested new high tunnel designs specifically engineered to withstand Idaho’s strong winds and heavy snow loads in a variety of research settings. Additionally, the team has conducted crop and cultivar variety trials evaluating crops identified by buyers and producers to be of significant economic potential as new or year-round enterprises. Diane Green serves as the Producer Advisor for this project and hosted a high tunnel and crop trial in 2014, 2015, and 2016. 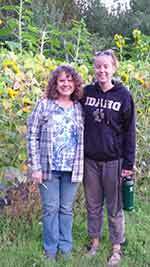 Green collected data on the trials and worked with University of Idaho extension educator Jen Jensen to conduct field days and workshops at her farm. She has been conducting trials on heirloom tomato, eggplant, cucumber, and pepper varieties that include seed collection since it is a desirable species for restaurant and retail/wholesale market sales. For the on-farm research at Greentree Naturals, they are comparing same species cucumber yields in a hoop house comparing to the high tunnel, same species peppers in a hoop house to a high tunnel, and same species eggplant in a high tunnel comparing to black plastic outside, uncovered. Each location has a data recorder set in place to record air temperature as a comparison of growing temperatures in a hoop house, high tunnel, and black plastic. Harvest records have been kept separate for each location to determine if yields are increased using one type of season extension vs. the other. I had several research plots on university experiment farms, but it was the research plot at Greentree Naturals that I valued the most. 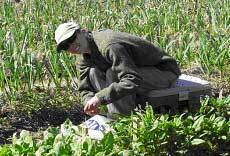 Having an experiment applied to a working farm is essential in agricultural research success. 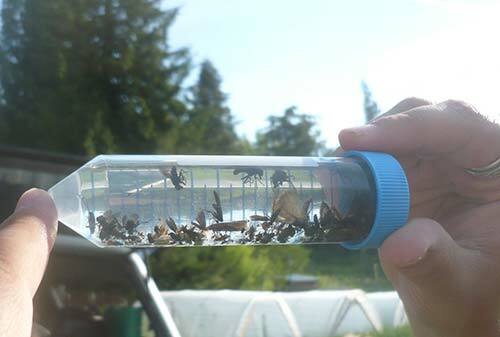 It was eye opening to see our trap crop being integrated into their organic pest management plan. Working with Greentree Naturals, I received experience interacting with local growers, interested community members and fine tuning my extension skills. I would not have received this experience anywhere else. With the help of Diane and Thom, I now better understand interactions between trap cropping, farm biodiversity and pest insects that will allow growers to utilize more-sustainable management options to control flea beetles in Brassica crops. I received indispensable knowledge and experience, but most importantly I made lifelong mentors and friends. It was such a terrific experience! For the past three years I have been researching trap cropping as a technique to control the crucifer flea beetle and I have had the wonderful experience of working together on this research project with Greentree Naturals. To give you a little background, the crucifer flea beetle is a common pest throughout North American which attacks plants in the family Brassicaceae (e.g., broccoli, kale, cabbage, collards, etc.). Chewing damage by flea beetle adults can lead to crop stress, reduced growth, stunting, and eventually death. This is important, because Brassica crops are a major component of mixed vegetable farms and organic growers are often limited in control techniques. Trap crops are stands of plants that attract pest insects away from the cash crop. We used a mustard trap crop at Greentree Naturals from 2009-2011 to protect broccoli from flea beetle damage. * Joyce completed her PhD in Entomology in 2011. Skills for on-farm trialing are more than a means to regulatory compliance. They are primarily a tool that maximizes a producer's agronomic and market successes while minimizing their risks of loss. Identifying and planting the best varieties available for individual farming systems is a highly beneficial risk management strategy for a wide range of producers. Through the on-farm variety trialing process producers have the opportunity to identify varieties that reduce the negative impacts of pests and diseases, result in optimum yields, are best adapted to their specific local environmental conditions, have good handling and storage qualities, and possess desirable marketing traits such as good flavor and attractive appearance. The value of such potential has far reaching economic ramifications. However, fitting trials into a working farm can be difficult to manage effectively without careful planning. Through the in-field trainings and the Guidelines to On-Farm Variety Trials growers will benefit from improved management skills that make trialing easier and more efficient while improving the quality of their trial data. Growers learned time-efficient data collection/trial evaluation techniques that increase the likelihood of successful trial results and save the grower costly expenses of time. 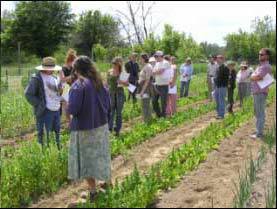 Hosting the field day on farms will demonstrate the feasibility of managing variety trials on a working farm. Greentree Naturals hosted a field day training (educational workshop) which provided a venue for Micaela Colley to share variety trialing approaches and methods learned from six different farm-sites. She presented the guidelines for in-field seed trial evaluations as well as an overview of the information contained within the study.